what they love to do right in front of your eyes. Or, if you'd rather take in the Falls in the park you're in luck. 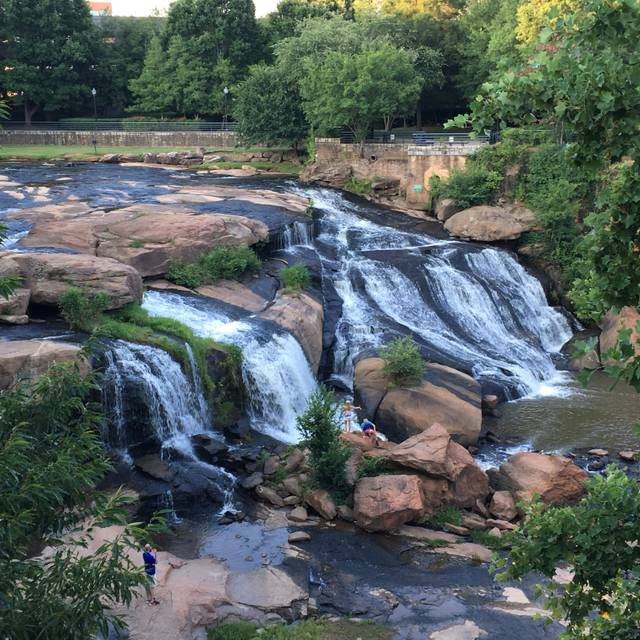 Passerelle's patio overlooks the 30 ft waterfall and the beauty of Falls Park. Come enjoy the best new restaurant in Greenville. Come enjoy Passerelle. Table 301 Catering is available for any event. Please call 864-232-7007 for details. 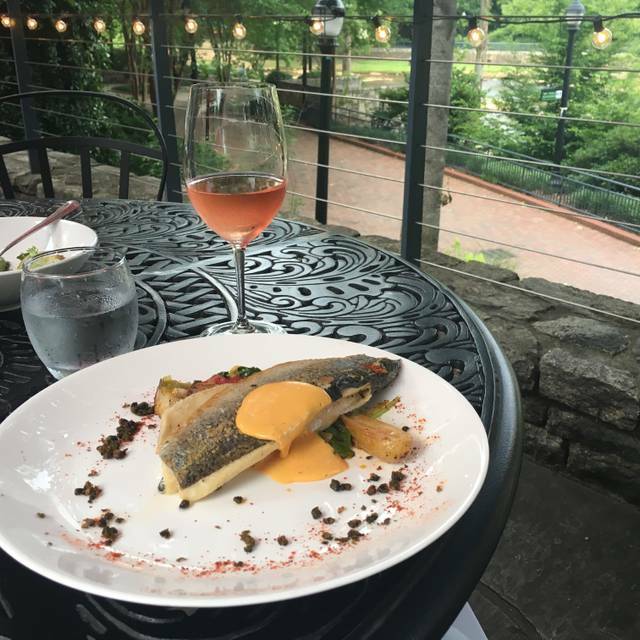 French for "footbridge", Passerelle is an aptly-named casual bistro located at the base of The Liberty Bridge which overlooks beautiful Falls Park in Downtown Greenville. Enjoy chef-inspired fare that"s a little French, a little European and a lot Local. Lunch, dinner and weekend brunch. Join us inside the warm and inviting bistro or dine al fresco on the patio with a view. Signature dishes include Mussels Passerelle, Ratatouille and Steak & Frites. The wine list includes a range of French varietals, from classics to interesting new finds. French cocktails and beers round out the beverage list. We had a terrific time outside in the beautiful patio. Service was good and our food was excellent. Thanks Linda! 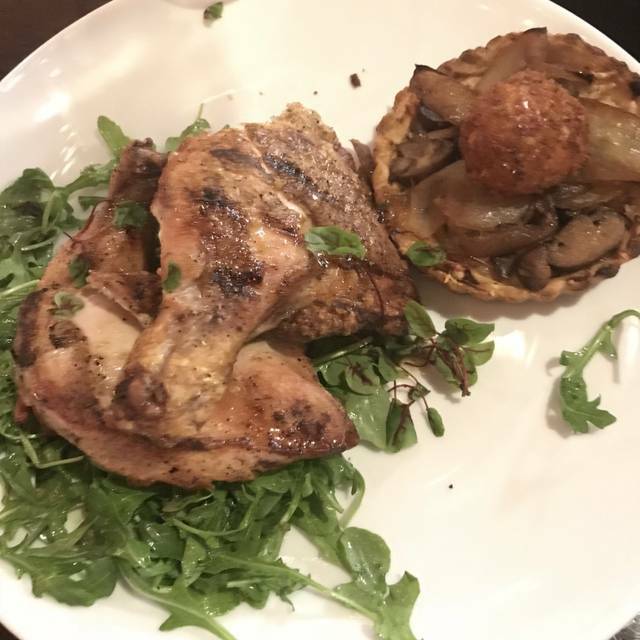 We are so happy that you joined us for a meal and enjoyed your experience. We hope to see you again very soon. We appreciate your review. I met a friend for lunch. We ordered the same thing, the roasted butter nut squash salad with shrimp. We paid $18 each for what looked like a side salad instead. For the value and food you receive, don't visit this restaurant. Go to Happy+Hale, it is worth money spent. Hi Teri. We are so sorry that you were not please with your butternut salad. We do use quality ingredients in every dish and that may explain some of the price. We would love for you to give us another try. We strive to provide every guest with great service, food, and value. We appreciate your feedback and will look into the portion size of that salad. Thank you again and we would love for your to return. 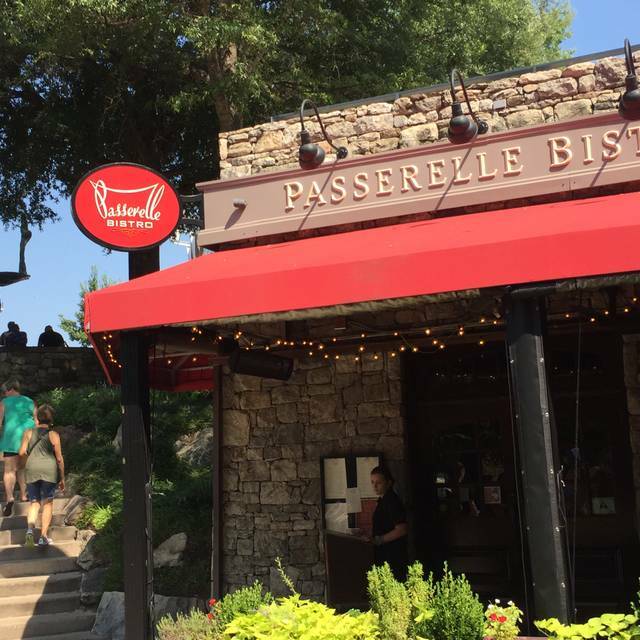 If you want to show off our beautiful city, outdoor seating at Passerelle Bistro is a great place to do it. Menu is somewhat limited and food is just okay but the view cannot be beat. Our waitress was not the friendliest (where the people of Greenville are very friendly)and service was VERY slow. In their defense, it was a glorious sunny day and the restaurant was busy. Our table was ready when we arrived for our 1 pm reservation. Wonderful lunch biking along the Swamp Rabbit Trail. Beautiful background on the patio.... Great service and food. highly recommend. Hi Gary! Thank you for joining us for lunch. We appreciate your business and taking the time to leave a review. We look forward to seeing you again in the near future. Service was pretty slow. I felt like we were forgotten about by our server. Waited over 20 min for a cup of soup and had to ask about when it was coming. Once entrees were brought, the server asked if we wanted remoulade and we said yes. We were almost done with our food before she brought it to us. It was not very busy and I expected better service based on experience at the other Table 301 restaurants in town. Hi! We apologize for you service during your experience with us. We strive to make sure that every guest has great service and food. We have spoken to the servers about this and would love for you to give us another chance to wow you. We appreciate your feedback and hope to see you again soon. This was our first visit to Passerelle since Table 301 sold it to the Passerelle employees. Don't know if it was an "off" night or if this is the new normal for the restaurant. Service was poor. We were seated indoors (it is high pollen season and my allergies can't handle) and were basically ignored. Those seated outside had excellent service (we could see it through the windows). We were also the only guests seated inside. My husband started dinner with a cup of excellent Tomato Bisque with Beet Puree (large cup!) My husband and I both had Salad Nicoise; his tuna, unfortunately, was over-seared, mine was fine. Since we couldn't get anyone's attention, we didn't send his salad back. Our server finally checked back with us after our entrees to ask if we wanted coffee and/or dessert. We ordered the Coconut Cake, which was excellent, and I had coffee. It then took awhile to get our check. 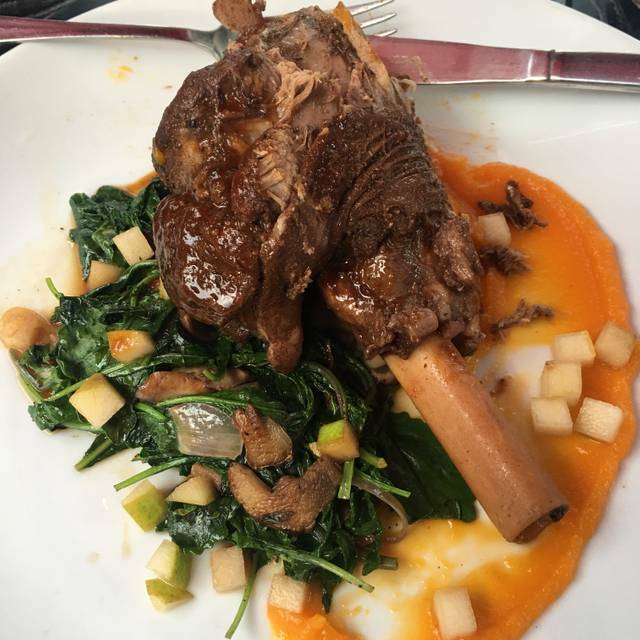 This is not the quality of food or service we had experienced with Passerelle was owned by Table 301. If this is how the employee-owners plan to run the restaurant, we won't be back. We were very disappointed. We apologize for your experience. We are still part of Table 301; the owner operator only owns a small portion of the restaurant at this time. We want all of our guests to have a top notch experience. We have spoken with the servers about maintaining the same level of service to every guest & are adjusting our sections to make sure that this doesn't happen again. We would love for you to give us another chance in the near future. We appreciate your feedback & hope you return. Our reservation was ready on time with a friendly host stand greeting! Our server was good, but slow to check on us for more drinks and to bring our check. Food was delicious, but we were not told that they were out of duck until we went to order the duck. Overall had a great experience, love the patio! Thank you for dining with us and leaving a review. We appreciate you and hope that you return again very soon. We will speak with the staff about the importance of relying items that are out. Thank you! We ordered our brunch at 10:30 (not too many people there yet) and yet it took about 30 minutes for our food to arrive. No explanation as to why. The food was lukewarm, the omelet had onions (in spite of being assured it did not) and at that point, we did not want the kitchen to make a new one. This was our first time there and I already cancelled a future reservation. Very disappointing. Thank you for your feedback. We strive to make sure that every guest has a positive experience with us. It seems that there were shortcomings throughout your entire meal and for that we apologize. We will definitely speak to our staff about this. We hope that you will give us another chance. Please come again soon and thank you for your review. We love this place! Great Food, service, and setting. Thank you Renee! We look forward to seeing you again very soon. Had family in town. Wanted them to experience the downtown park area. Service was great, food was excellent. Thank you for your review. We are so pleased that you brought your family to dine with us. We appreciate your business and look forward to seeing you again soon. Great food and great location! Our server was the only server working but she never missed a beat! She was attentive even thought she was very busy, we did not feel neglected. We will definitely go back. This was our second visit!!!! Hi Stephanie! Thank you very much for your review. We are so pleased that you enjoyed your experience with us. We look forward to your third visit! Thank you. Not good at all. Big disappointment. Went there prior to Chicago at the Peace Center. Service was like having to wave down a server who were running inside and out. Obviously under staffed. Food was no where near the quality as in the past. The lamb was poor. The trout was dry. I won't go again. They have gone downhill as have several of the downtown restaurants that want to charge a big price but allow their value to decline. Hi Jimmy. We apologize for the shortcomings of your meal. We definitely want to wow every guest that comes in. We apologize for the lack of service; we are working on getting more staff currently. We would love for you to give us another chance. Thank you very much for your review and we would love to see you again. The food is overpriced and far below average. They ran out of the one dish I was wanting and it was early in the evening.We had outdoor seating and it is a beautiful location. However, the locale did not make up for the poor food in for service. Hi David. We apologize for your dining experience with us. We strive to make sure every guests gets top notch service and food. We would love to make it up to you on a return visit. Thank you for your feedback. We are very excited for your return! Thank you for your review. We love that you enjoyed your meal with us. We look forward to seeing you again soon. This was our first time dining here and it did not disappoint. 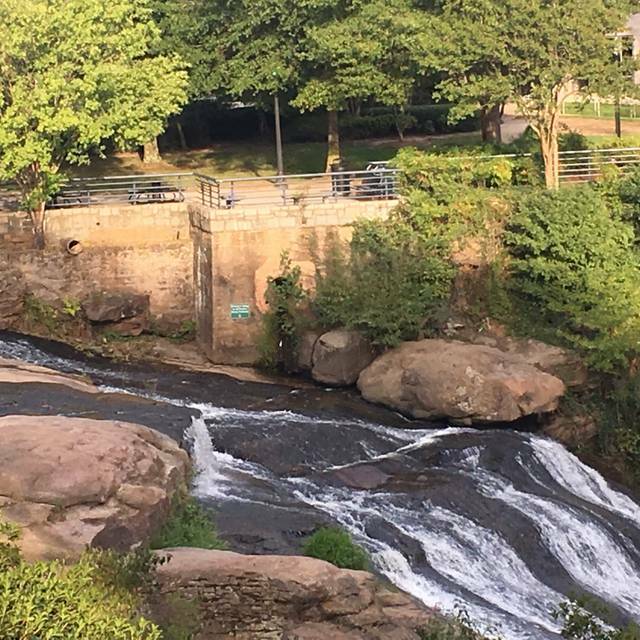 We had outdoor seating overlooking the liberty bridge and reedy falls river. We began with a bottle of cab franc and the mussels appetizer. That was phenomenal. Please never remove that from your menu. I would get that as my meal next visit. Thank you for your review. We are so happy that you dined with us and enjoyed your experience. We love that our place has a sense of family and hospitality. Our owner, Carl, is wonderful and we are happy that you had the chance to hear part of his story. We are very excited for you to come back and see us again. Great location, food and ambiance. We always visit when in Greenville. Thank you Stephen. We hope to see you again soon. Even with reservation, waited for a table; however enjoyed our drink and the table was worth it! Thank you for your review! We apologize for your wait but so pleased that you enjoyed your time with us. We look forward to seeing you again very soon. Our waitress, Miranda, was very attentive . Thank you Sandy. We appreciate you taking the time to write a review. Please come back and see us again soon. Food was very good but a bit expensive considering the serving size. That being said I realize this is a prime location and specially dishes. Something could be done to dampen the noise level. Staff was very friendly. Hi Patrick. Thank you for your feedback. We are looking into the noise issues. We hope to see you again soon. Always enjoy Passerelle. Delicious Butternut squash salad was small portion for lunch entre. Served w no bread/crackers. No offer of dessert. Left hungry. Hi Melanie. Thank you for your feedback. 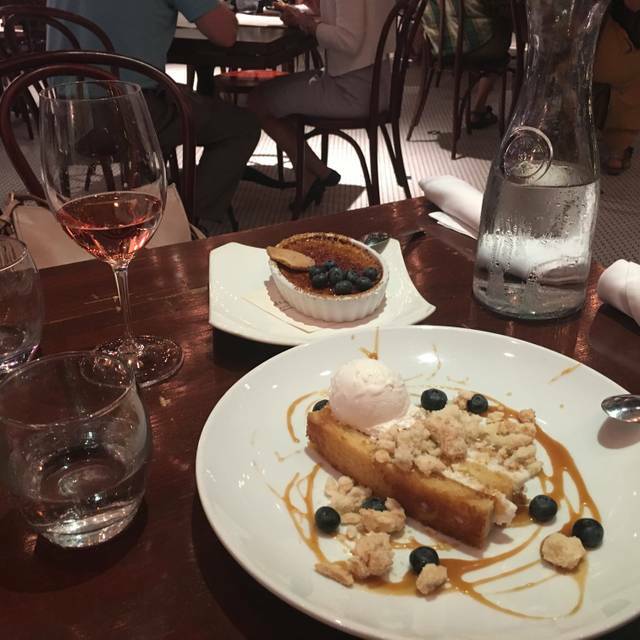 We love that you enjoy Passerelle but we would like to make sure your experience is top notch at every visit. We strive to make sure that every customer leaves completely satisfied. We apologize for not offering dessert as well. Please come back and see us again soon. Thank you. We were quickly seated, our server was very attentive and the food was delivered quickly. I ordered the Passerelle Benedict - the eggs were poached to perfection. The entire dish was delicious. Everyone in my party enjoyed their food. Plus the coffee was the best we had while in Greenville. We will visit again next time we're in town. Thank you for joining us for brunch! We appreciate your business and you feedback. We hope to see you again very soon. Thank you for joining us for such a special day. We are so glad that you loved your mini cake. At Passerelle, we loved making occasions memorable. We appreciate your feedback and hope to see you again very soon. Food is usually excellent but it was lacking on this visit. The salad had wilted, ugly lettuce and the salmon appeared to have been frozen and was way overcooked. Service was great tho!! Hi Steve. We strive to make sure that every guest has the best experience as possible and we apologize for the less than great meal you received. We hope that you give us another chance to make you a top notch meal. We appreciate your feedback and can't wait to see you again. Food was excellent. Service very pleasant and attentive. Thank you very much for your review. We appreciate you taking the time to dine with us and to give us great feedback. We look forward to seeing you soon! Hey Karen. Thank you for your review. We are so happy that you enjoyed your food and location but we do apologize for the lack of service. We definitely want every guest to have a wonderful experience. We hope that you return and give us another chance to wow you. Thank you again. 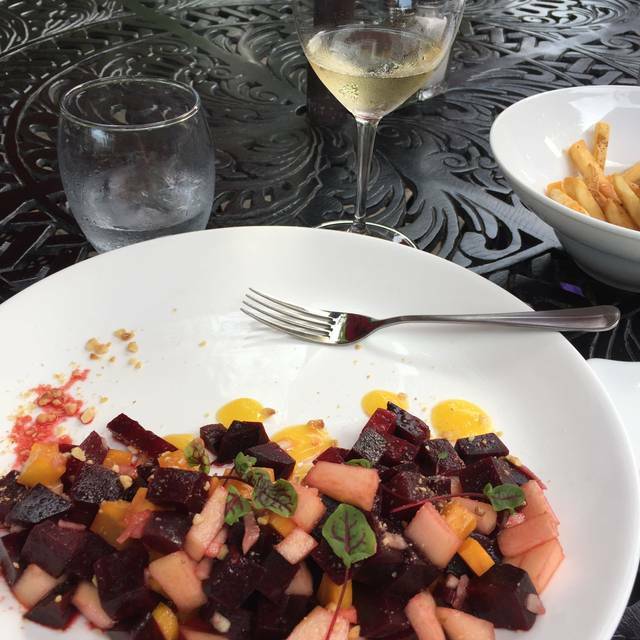 Very nice meal, wonderful atmosphere on the patio, excellent service. We eaten breakfast & dinner there & enjoyed both. Thank you for a wonderful review. We look forward to seeing you soon! My wife loved the ratatouille. Steak frites were a disappointment to me and my teen son. Cuts of steak were tough and fries were not great. My son said he much preferred steak frites at Trappe Door. Wine was great. Wait staff was very good. Hello! We are happy that you tried our restaurant and thankful that you took the time to leave a review. We apologize that the steak and frites was not up to standard. We are in the process of finding a different cut of beef for the dish because of a few reviews. We hope that you come back again and give us the chance to provide you a top notch meal. I was taking friends out to lunch as a thank you, and I was so embarrassed. Even though I had made reservations, we had to wait for a table and we were sat right near the serving line. No one acknowledged us for several minutes and I had to find the host to even get us water. Our server finally appeared and without welcoming us or asking if we had any questions about the menu, wanted to take our order. We saw so much food on the line waiting to be picked up it, and some of it was ours. The table next to us received their food before ours, even though we had ordered before they even sat down. Our food was cold, but we couldn’t let our server know because she never checked on us (it was delivered by someone else). Very disappointing experience. Good Morning. I must apologize for your experience at our restaurant. We strive to make sure that every guest has a wonderful experience and there is no excuse for yours. We have spoken with the staff and expressed the importance of being attentive to their tables. Please give us another chance to wow you. Thank you for your review. We went there for the first time. They were accommodating with an all cheese plate for me. The only issue is that the doubled up on the two cheeses already included on the charcuterie and fromage plate. I understood that other cheeses were going to be added. It was just a bit much to have loads of two cheeses. The baguette first came out severely toasted (I requested it not to be toasted at all). They returned with the untoasted baguette and it was stale and broke apart when I tried to tear it. The gentleman was very polite and courteous. The other meal my wife had was excellent, only the eggs were slightly undercooked. Our server was great. I believe the gentleman, who we saw the most, was maybe the front-end manager? He was very attentive. While the food was fine; we were hoping for a true French culinary experience and it just didn't happen. We left full, but unsatisfied. Hello Christine. I do apologize for the shortcomings of your meal. We strive to make sure that every customer leaves our restaurant completely happy. We do typically feature two cheeses on our charcuterie board. We do have other cheeses in house that should have given to you. I have spoken to our staff and they are now aware of what to do if something like this occurs. We hope that you will give us another chance to make your experience a great one. We apologize and appreciate your feedback. The food and service were excellent. Menu choices are great. It has a real bistro feel. Value is great compared to other places with similar food. Thank you very much for your review. Please come back and see us again very soon! Get together with friends over brunch. The lobster soup had no taste of lobster and was like a seasoned red cream soup How could we take your resturant seriously when the wood tables were heavily scratched and the leather on the seats was riped beyond repair. The value was not there for what we paid and further did not enjoy your premier dessert. I would not recommend this resturant. We apologize for your experience with us. We have began discussing the upholstered chairs. We would love for you go give us another try. Thank you for your feedback and we look forward to making up for your lack luster meal. Wonderful cc0mating. Especially Gaul for the kind service and good food for our young children. Very good value on wines. Intimate space in a delightful setting. 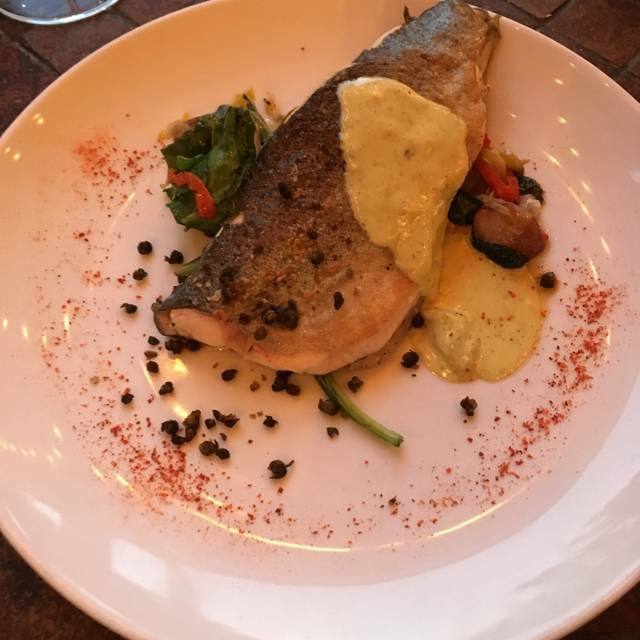 Thank you for dining with your family at Passerelle. We strive to have selections for every member of the family, including dogs! We appreciate your review. Good food, however the waitress did not check on us once after the food arrived. She only stopped by quickly to drop off a dessert menu. Felt very rushed to get out. But again, good food. The trout was great. Thank you for your review and for dining with us. We are so happy that you enjoyed our cuisine. We apologize about your service. We have spoken with our staff about the importance of checking with our costumers to ensure every aspect of their meal is perfect. Thank you again for your wonderful feedback. We were sat immediately. Small but very quaint spot. Great apps and main courses. Dessert was nothing special. Service was good and fast. Great drinks. Recommend the French Martini!!! Went for Valentines Day and was blown away. Delicious lobster bisque appetizer paired with their recommended champagne, followed by two of the best entrees I’ve had in years, a perfect New York Strip and a Blue Crap stuffed Flounder each with a perfect wine pairing. The two desserts we had were fantastic and accompanied by a delicious paired white desert wine. Service was quick and professional, ambiance was pleasant and romantic without being stuffy. Very pleased. Thank you Stephen for dining with us for Valentine's Day. We appreciate your feedback and are thrilled that you had such a great experience with us. Please come back and visit very soon! My husband told me to choose anywhere I wanted for Valentine’s dinner - so I did! The food was so good, the portions just right, and the atmosphere had just the right ambience - lovely without being stuffy. Our food arrived promptly and we enjoyed it at our leisure. The sic was a nice touch as well! Thank you! Hello Tess! Thank you for joining us for such a special occasion. We do special menus for almost every holiday and would love for you to check them all out. Thank you for your review and we hope to see you very soon! We dined on Valentine's Day and had a great time. It was the best meal we've had in a while and the ambiance was great! They had a live accordion player throughout the night. M'Randa was our server and was outstanding. She made recommendations and made sure we had a great time. She deserves a raise and all of the best shifts and tables. Thank you Sara. We appreciate your review and you coming to dine with us for such a special occasion. We hope to see you again soon.